Toddlers are prone to illness and tummy bugs are especially common in children under the age of five. If you’re new to parenthood, it’s common to panic the first time your little one is struck by vomiting and diarrhea. However, the majority of the time these tummy upsets are nothing to be concerned about. While you should always consult a doctor if symptoms persist, it is usually possibly to safely eliminate the bug yourself. Before you do attempt to soothe your toddler’s symptoms, it’s worth noting that there are a few common mistakes parents often make which can actually cause the bug to get worse. Don’t worry if you’ve tried them, it doesn’t make you a bad parent! The 5 common mistakes below are often unknowingly recommended by friends and family. 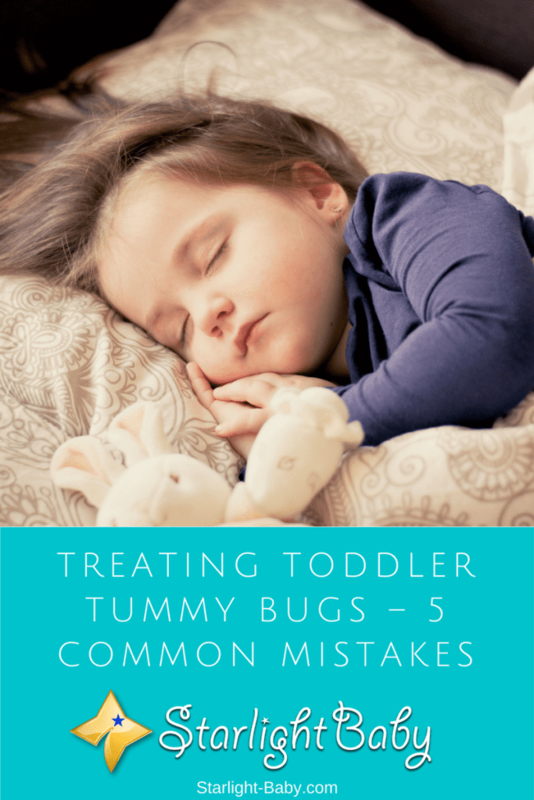 Even if you have tried them, being aware of these mistakes will help you to avoid them the next time your little one develops a stomach bug. Download a free, printable copy of this post by clicking here! Getting the fluid intake just right can be difficult. If your toddler has spent a lot of time throwing up or suffering with diarrhea, it’s common and logical to worry about dehydration. Therefore, immediately after they have thrown up, you might want to offer them a glass of water. This is typically a mistake. After vomiting, the tummy is often inflamed. This means any liquid which passes through is likely to upset the tummy further and it will be brought straight back up. Instead, it’s often better to offer the water 10-15 minutes after your child has vomited. Even if they ask for a drink right away, explain to them they need to wait a little otherwise they could be sick again. Likewise, some parents think they need to wait hours after their toddler has vomited before they can offer a drink. This isn’t true either. You should follow the advice above and let them drink 10-15 minutes afterwards. It’s also best to start by offering them just a teaspoon of water approximately every 15 minutes. If they manage to keep it down for at least an hour, then you can start giving them a drink more frequently. After a few hours have passed, you can transition from water to nicer tasting things such as ice pops. If your toddler has a slight fever, it’s natural to want to offer something to bring the temperature down quickly. However, the key thing to remember here is that an increased temperature is a sign that your little one’s immune system is working. Therefore, it will naturally fight off the bug and bring the temperature down in due course. It’s always better to let your toddler’s body do its job without interference. The only exception to this is if your toddler’s temperature is over 101 Degrees Fahrenheit. In this instance you will want to consult a doctor to ask for advice on bringing the temperature down. The reason behind this is because if the temperature is quite high, your little one is going to be more reluctant to drink liquids. The pharmacy is the one place you feel you can turn to for help. After all, the medications available are bound to help right? Unfortunately, many over-the-counter diarrhea remedies can be harmful to your little one. They come with some pretty severe side effects for children. Medications such as Imodium are perfectly fine and can be helpful for adults, but they are definitely not recommended for children. Only in severe cases are medications used to treat toddler diarrhea and even then they are prescribed by a doctor. Instead, you might want to consider giving your little one yogurts containing a good bacteria known as acidophilus. This is the only other thing that’s safe to treat tummy bugs along with fluids. Have you ever wondered what to feed a toddler with a stomach bug? When they start to manage to keep liquids down, it’s common for parents to switch to giving their toddler sugary and dairy products. What you might not realize is that when your child has diarrhea, it can cause a temporary intolerance to lactose. Fructose contained in sugary foods and drinks can also further irritate the tummy, causing diarrhea to flare up again. To be safe, it’s best to stick to water only until the bug has cleared up completely. If your toddler’s bug is a particularly nasty one, they may not be able to eat solid foods for a day or two. This is perfectly normal and a liquid-only diet for a few days won’t typically cause any concern. However, keeping them on a liquid-only diet for a longer period of time isn’t a good idea. Your toddler needs sufficient nutrients in order to fight off the bug or virus. If they are struggling to keep solid foods down, start off by trying mashed bananas, pasta and dry toast. Starchy foods are best as they are least likely to upset your little ones stomach. It’s also important to start adding small amounts of chicken, white fish and other protein foods as these contain the main nutrients your toddler needs. These are the 5 most common mistakes which are pretty easy to make. It’s worth stressing here that any illness your toddler picks up should be diagnosed by a doctor if it persists for longer than two days. They will be able to give you the best advice on how to treat the bug and what has likely caused it. And remember, only give medicines to your toddler if prescribed or recommended by a doctor. Thankfully we have not experienced any major stomach problems in our baby yet. However, if the mother does not take care of what she puts on her stomach, the baby shows the symptoms (because the baby feeds on his mother’s milk). If the mother is eating hot and spicy food, the baby will have to lose motion. If the mother is eating food that lowers the body temperature, the baby will have a cold. Since the baby feeds on mother’s milk, we have to take a lot of care on what the mother eats. I totally agree with you, vinaya. The mother should be careful of what she eats because it gets passed on to the baby thru breastmilk. Breastfeeding moms should watch what they eat. Breastfeeding moms should take a lot of care on what she eats. I tell this from my experience. Once the mothers discontinue breastfeeding, her focus should be on what she feeds the baby. Fruits might not be good for babies as they are to the adults. Since fruits are generally eaten raw, fruits might contain bacteria and virus that might harm the baby. Fruit skins are good for the adults but the fruit skin might clog the baby’s throat. Raw food is good for the adults but not for the babies. You need to know what is good and what is bad for the baby. That’s true, vinaya. Every parent should be conscious about the food they give their baby because not all fruits or foods that are good for adults would also be good for baby. Parents should know the foods best for baby. Personally, I’m strictly against using over the counter drugs without getting a prescription from the doctor on what drugs to buy for the kid. It’s not medically safe because some drugs can have a pretty side effects that one never expected. It’s better to go to the hospital in my opinion. I agree. I also do not feel comfortable buying over-the-counter drugs for my kids when they were still babies or toddlers. I have heard a lot of horror stories about overdose in children and I am truly scared of it. I would rather pay doctor’s fees to consult with a doctor regarding my child’s condition and what meds to give him/her rather than do self-prescription. No way. Without proper prescription from the doctor, I would never support going to be chemist to buy over the counter drugs. The side effects of it is too much than the advantages it would offer. Normally, it’s best to have a family doctor to reach out to in any time of emergency. Enter your first name and best email to receive a downloadable and printable PDF of this post!